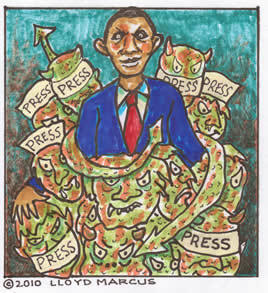 The liberal media is either stupid, insane or totally in the tank for Obama. My gut tells me it is the latter. Folks, America is in deep trouble. The liberal media's blind all consuming idolatry of the first black president trumps national security, our economy and America itself. I'm talkin' off the chain Obama-mania. In the eyes of the liberal media, it is ALL about Obama, mm, mm, mm. How else can you explain Obama presenting his budget which continues to spend trillions we do not have, while almost in the same breath, proclaiming we must live within our means and the liberal media not calling him on it; totally ignoring the contradiction. Are they stupid? Are they crazy? Or, have they completely, without pretense of objectivity, thrown their chips “all in” for Obama; turning their backs on America to prop up their Golden Child? With the exception of his skin color, Obama's presidency is unprecedented for all of the wrong reasons. Frighteningly and dangerously, none of the rules apply to this man. Obama's arrogance knows no boundaries from taking over private secular industries to passing Obamacare against the will of 70% of the American people. The list of his bypassing the rule of law, overreaching and power grabs go on and on. Most recent, Obama, our omnipotent ruler flipped the bird to the Constitution, again. A federal judge ruled Obamacare Unconstitutional which means, “Stop”! King Obama ignored the ruling and continues to implement Obamacare. Meanwhile Obama's liberal media supplicants eagerly worship at his feet and vow to punish all who dare oppose him or his socialist agenda. As I stated, patriots, our country is in deep trouble with this president in office. We MUST vote Obama out in 2012. I am Vice Chairman of “One Million People To Defeat Barack Obama 2012.” Please join us!